Alright, alright, alriiiiiiight (Kevin Hart voice)!!! The Atlanta Food & Wine Festival starts TOMORROW!!! From noon on Thursday until Sunday the 13th, foodies from all over the city will be descending upon Midtown (near 11th St and Peachtree Walk) to grub and chug to their heart's content. But, this isn't like Taste of Atlanta where you purchase a few food tickets and get a few hearty samples. This is a real deal, big money, foodie fantasy come true. This weekend long event puts patrons in front of the best chefs, mixologists, barbecue pit masters, and local growers that the city has to offer all in the name of celebrating the food and beverage traditions of the South. At least that's what their website says. But, when you start to click around and find information on the various scheduled events, you see numbers like $100 to enter the Tasting Tents, $150/person for the dinners, $180 for day passes, and $500 for 3 day passes. I don't know about ya'll but that doesn't really seem to reek of southern tradition and hospitality to me. But hey, what do I know?? If any of our readers plan on going, we'd love to hear about your personal experience. We'd even be interested in one of you doing a AF&WF daily journal for us to feature here on the site. Hit us up if you're interested. 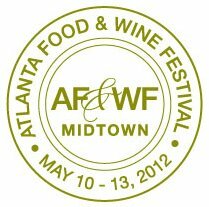 For more information on the AF&WF, log on to their website or follow them on Twitter - @ATLFoodandWine - or click here to LIKE them on Facebook.